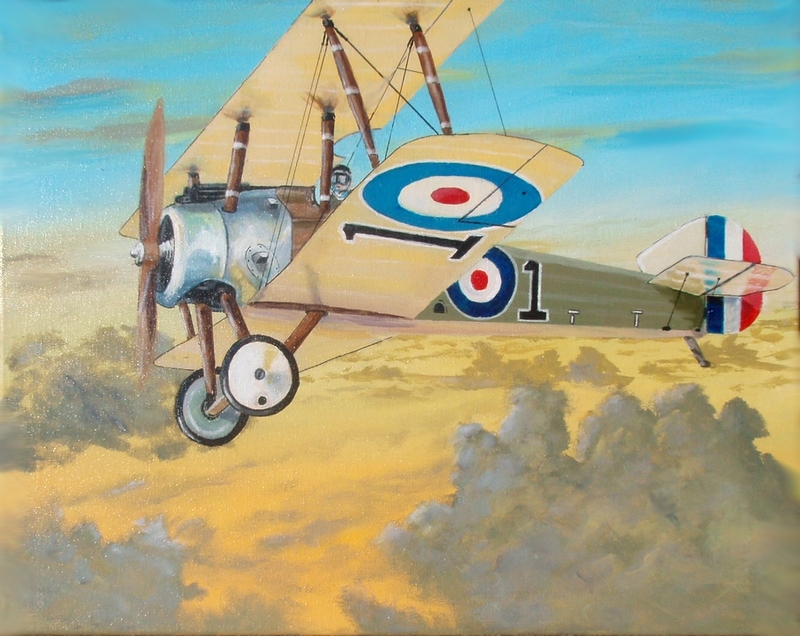 This is an acrylic on canvas, 18X24, depicting a WWI Sopwith Camel with British rondels, (the circles in red white and blue). There were 5490 manufactured during the war years. Top speed was about 115 mph with a maximum service ceiling of about 20,000 feet. The average loaded weight was under 1500 lbs, The twin machine guns fired through the spinning propeller thank to a synchronizing gear on the engine. The small boxes protruding from the port side of the cowling are for dumping fired shell casings from the twin Vickers machine guns. The Camels had a radial engine that produced a rate of climb near 2200 feet per minute. This entry was posted in Art and tagged aviation art, British, Jack Lee Art, Lee's Neuport, Neuport. Bookmark the permalink. Wow, Mr. Jack, that is really good. I mean it. But are you ever going to paint a portrait of George Noory? If you do and you send it to him I know that would make his day. Heck, it would make his entire year! Also, will you teach people here how to paint? Also, I don’t understand how that plane could be flown at 20,000 feet back in those days. Wouldn’t a person be unable to breathe at that altitude? I believe in those days they didn’t have oxygen masks. Also, I believe the temperature at that altitude would be well below zero so the pilot would freeze to death. So this does not make sense to me, but I am not as smart as you so maybe you could tell me. Thanks Ted appreciate the kind words and yes, I would be happy to show people the basic formulas for painting. I’m teaching an art class this semester, but I think it may be too late to enroll, my class roster shows full. Sorry, but maybe next semester? Next as to the questions, yes, you can breath enough oxygen at 20,000 feet, but at 25,000 it gets risky and the FAA requires a supplemental oxygen to be ready if needed. As to the air temp, absolutely its cold! But they also had cold weather flying suits that helped… a little. I think a WW I plane flying at 20,000 was not very common. I’ll bet it was somewhere between 3000 – 5000 ft. Those old planes only had a 300 mile range, so you would burn up a lot of fuel just trying to reach 15,000′ – wouldn’t be worth it. Better to stay at low altitude to observe troops and things, yet be high enough to avoid most ground fire. Being a pilot back in the day was pretty scary, if the enemy didn’t get you, your own plane might – accidents claimed a lot of air aces.